Artist's impression of Neosat. Credit: ESA. Both Airbus Defence and Space’s and Thales Alenia Space’s share of the Neosat product lines will enable the UK space sector to play a major role in the supply of equipment and platform building blocks. Airbus will play a major role in the satellite design, communications module, service module and propulsion module definition, while Thales Alenia Space UK will contribute to the design and manufacture of the propulsion subsystem via their Neosat product line. The remainder of the €18 million contract will be distributed as the programme develops. 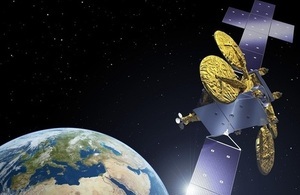 The new contract follows the UK Space Agency’s increased investment to over €200 million in the ESA telecommunications programme, ARTES, at the last ESA Council of Ministers. The European Space Agency (ESA) projects that there will be €30 billion worth of telecommunications satellites built before 2030 and anticipate that Neosat will form a significant portion of that new market, representing a potential return for UK companies of billions of Euros. “This new platform provides a significant opportunity for the UK space industry and will not only help to create as many as 100,000 new jobs by 2030, but also to deliver future orders and exports for the industry. The contract for Phase-B of Neosat was signed today by Magali Vaissiere, ESA’s Director of Telecommunications and Integrated Applications, and Eric Beranger and Bertrand Maureau for prime contractors Airbus Defence and Space, and Thales Alenia Space, respectively. Neosat will also help expand the UK supply chain as several suppliers, such as European Space Propulsion and Reliance Precision, have been identified for pre-development contracts. The two co-primes will also run competitions between equipment suppliers for platform building blocks and the winning bidders will become part of the industrial consortium for developing the two platform lines. Crucial to the success of the platform lines and UK industry participation in Neosat are the predevelopment activities running under National Space Technology Programme flagship projects, jointly financed by the UK Space Agency and the Technology Strategy Board. Satellite telecommunications is at the heart of the UK space industry, with the previous round of ARTES generating £750 million of private investment and sales. Neosat will build upon the success of the Eurostar and Spacebus platform lines. The communication modules, service modules, propulsion systems and mechanisms for the Eurostar line have been UK based for the last 25 years. The most recent E3000 model has generated 41 export contracts, including sales to the US, Russia, Middle East and Asia. Applications include Sky’s TV distribution over satellite, enabling broadband internet and mobile coverage even at the most remote locations as well as secure communications for the UK armed forces. The contract for Phase-B is expected to last around 13 months. The subsequent Phase-C/D will start in 2015 for the development and manufacture of the first two prototype flight platforms, launch in 2018–19 and in-orbit demonstration under a public–private partnership to be established with satellite operators. Neosat is part of ESA’s Advanced Research in Telecommunications Systems programme (ARTES), and aims at developing, qualifying and validating in orbit next-generation satellite platforms for the core satcom market. A crucial objective for Neosat is to reduce the cost of a satellite in orbit by 30% compared with today’s designs by the end of the decade. Existing technologies will be used in innovative ways and to achieve economies of scale by creating a common supply chain for both satellite prime contractors. The Neosat product lines will offer the option of all-electric, hybrid electric/chemical and all-chemical propulsion versions. Neosat will be optimised for electric propulsion – both for raising the satellite into its final orbit after separation from its launcher, and for maintaining its operating position. Electric thrusters use significantly less propellant than traditional thrusters to reach the same destination. In the hybrid and all-chemical versions, the telecommunications operator will have the flexibility to speed-up orbit-raising using chemical propellants – a manoeuvre that could take a few months by electric propulsion alone. Neosat is based on cooperation between ESA and France’s CNES space agency, and managed by a joint ESA–CNES team.